Gion Manju is a Japanese sweets shop located next to the Minami-za Theater. This venerable shop was established about 200 years ago. 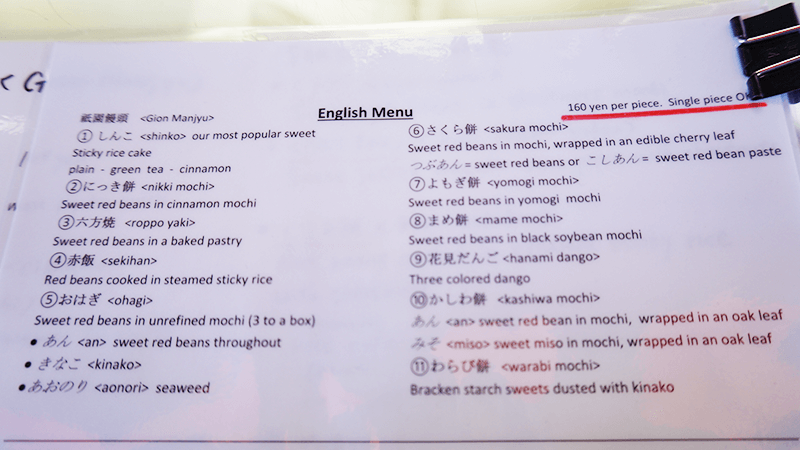 Their specialty item is Shinko “sweet sticky rice cake,” made from rice flour. Its springy texture and mild sweetness have made it a longtime favorite of Kyoto residents. They also offer a selection of petite confections that are great for taking to go. For a group of people, we recommend buying the Shinko three-variety combination, all made with seasonal ingredients. Take a walk around Gion, enjoying the various flavors and textures of wagashi. They offer three flavors. The light brown is cinnamon, the white is plain, and the green is green tea. Their small size and cylinder shape make these treats easy to eat while you stroll. Chopped chestnuts and red bean jam fill the outer rind. There are two kinds with different kinds of red bean jam. The one topped with yellow soy flour is called tsubuan, and the one without it is called koshian. *Sold from late September until mid December. 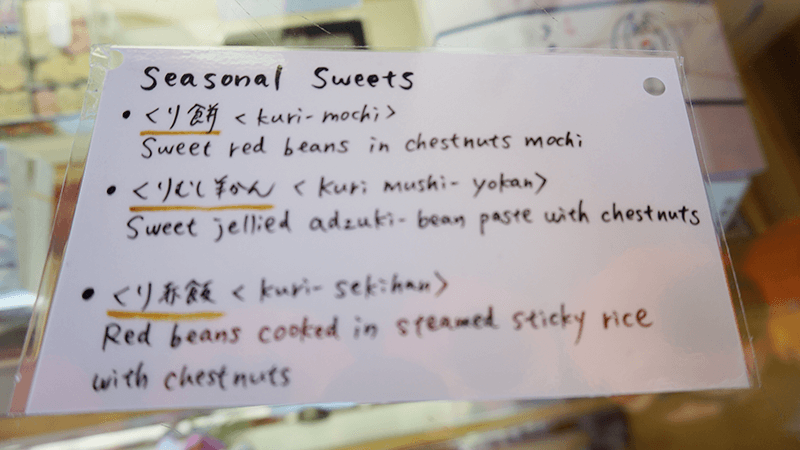 A treat sold year-round that is also popular among foreigners. Delight in the lovely scent of cinnamon. Large chestnuts cut and packed with a sweet bean jam. The sweet flavors of chestnut and red bean jam complement each other wonderfully. *Sold from late September until mid December. The shop clerks will happily serve you while you look at an English menu. This should help you understand what is in each product. And even if you can’t really understand what the shop clerks are saying, you can at least see an English menu. All of these items should be eaten the same day or the following day, so they are not suitable for taking home as gifts. We recommend eating them while walking around or taking them back to the hotel for a snack. Take these with you on a walk in Gion! The shop front is tiny, though, so move along quickly after you make your purchase! Since the store only has two sales clerks, they like to minimize the time spent on orders.